Large-scale shadow theatre from a bird's-eye view. Crows are re-dreaming the world. Is the future all it's cracked up to be? This modern fable is told using handmade layered projections, puppetry, masks and an original musical score. Mind of a Snail's large-scale shadow puppetry is quirky, colourful and beautiful, like early animation performed live before your eyes. This was a show I had the exciting opportunity with which to randomly choose a time slot and a location and see what happens. I had absolutely no idea what I was walking into with this production from Mind of a Snail, aside from a blatant clue that there were birds involved. What I experienced was an journey through a bird’s eye view, beginning with a crow giving birth (the science of which I am still unclear on) but I’m certain most episodes of labour and childbirth aren’t nearly so entertaining. The story follows the life of crows starting out in a nest, and the struggles of survival, encountering challenges, and finding their way through the world it as it changes around them. 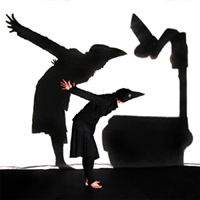 What makes this performance unique is the large scale shadow puppetry, physical theatre and the use of projectors with vibrant and colourful stencils used to tell the story. Speech bubble slides are used on the projectors as the main source of dialogue and not a single opportunity for a bird-related pun was missed. The soundtrack for the performance was recorded and produced by the cast themselves, and is absolutely gorgeous. The other neat thing about this show is that without a lot of dialogue as the story progressed visually, it allows the viewer to see the images presented and create a story in their minds as they interpret what they are seeing. I’m nearly certain that most of us will have a general understanding of the story, but each of us will come away with a different understanding. Its a show that makes your imagination soar and find meaning in a way relevant in individual ways. The time it must have taken to create the material alone must have been extreme, and the resulting product is visually impressive. Its the perfect blend of odd, unusual, beautiful and different. I always love a good story, and their method of storytelling is comical, stunning and extremely well done. Definitely worth checking out!